I hope you read that title out loud in your best Seinfeld impression. A recent question in our forums made me aware that there are more properties that can be added to @font-face than the usual font-family and src suspects. What are the point of those? Why would you want to declare other font declarations there? You'll see this plenty when looking at @font-face code generated by font services. That's an analogy you can use to think about @font-face declaration blocks. The font will be downloaded and used, if it passes the gatekeepers. The font-family is the obvious one. You're declaring a new font-family to use, so any element that wants to use this font needs to have a matching one. With exception to font-variant and font-feature-settings, all of the properties can be used as filters that instruct the browser to download and use the font files when the values match. 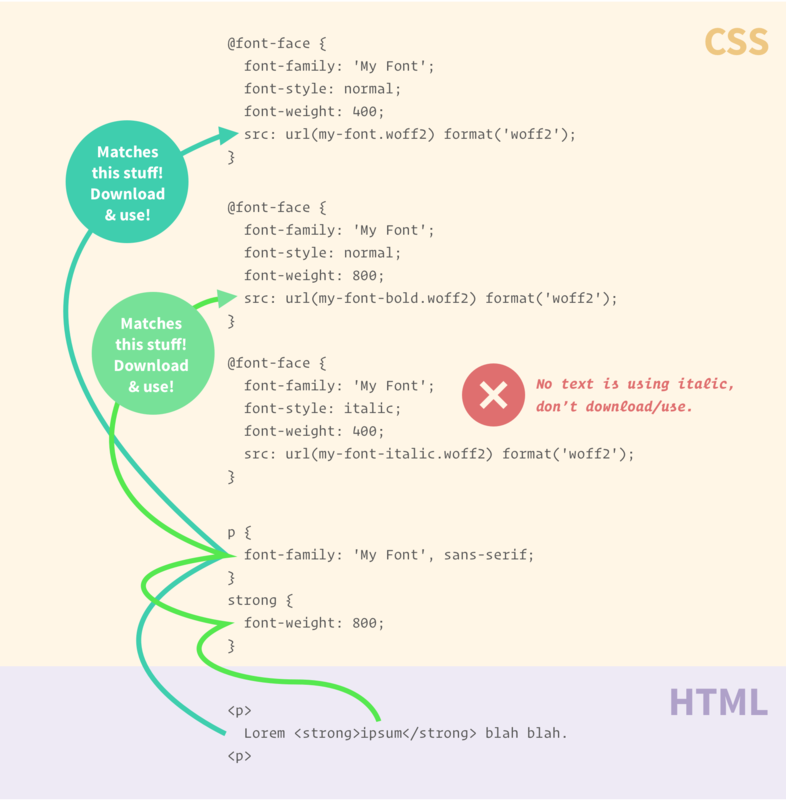 A diagram showing HTML, the CSS selectors that match that HTML, and the @font-face declration blocks that ulitmately apply. Interesting, I knew about font-weight & font-style, but not unicode-range. Glad to learn of it. Time to optimize! Cheers Geoff. Helped me out! Man. I’ve never thought of it like that. So it only downloads when matched? I’m going to have to play with that. Thanks! Looks like this will free some bandwidth ! I never saw it from this perspective before and certainly didn’t know that it affected font loading. Great to know, thank you. I use the font attributes a lot, so I was surprised that you didn’t mention the more obvious aspect: It simply allows you to access different font-weights and font-styles of the same font using the same font-family declaration (which is the way I assume fonts are intended to be used in CSS). So instead of having to replace the entire font-stack in the “font-family” property of my CSS, I can just change the font-weight to bold and keep using the same font-family. It also helps avoiding lots of cryptic font names such as “MyFontBld” and “MyFontBldCnIt”. @Geoff, the way I understand it is that when inside a @font-face declaration, font-weight and font-style don’t set any page styles; rather, they associate a font file with a specific style. Essentially it says “this is the Normal weight, Regular font. This is the Normal weight, Italic font. This is the Bold weight, Regular font”, etc. So whenever an element – say, an <em> – calls for a specific display type, the browser says “oh, you want Italic? OK, this is the file I should use for that”. Your first example works when I add the line font-style: italic to the h1’s declaration – because the element is now asking for a bold, italic font, it displays the proper font file: http://codepen.io/smcginnis/pen/eZGZvP?editors=1100 (sorry for the color change, btw, the red was hurting my eyes). Rereading the article, it seems that you probably know this already, and perhaps you just weren’t sure what Nils was saying. But I thought it was worth commenting anyway, in case anyone else needs the information. * I actually changed it to Georgia in my fork, so that you can see that even though the h1 is rendered with Arial, which it asks for, the em inside it is rendered with the actual font file that the @font-face block tells it to use for Arial 700 Italic. I also had to remove the CSS Reset from both forks, since it was messing up the default weight and style for the elements. For better coding and for better reading, I think giving same font-name with different font-style and font-weight works better.